So, you are a developer and want to get your hands dirty coding for the for the Nokia N9 (and maybe you even got one of those nifty Nokia N950 handsets), or just want to add some extra capabilities to Quill... Anyway, for me the journey started while toying with the Gallery application: I noticed that three is no tool that would convert images to grayscale in the image edition mode! So I decided to step in and hack on a bit. Take a close look at the middle screenshot in the image below. Can you spot the “Desaturate” tool? That tool is added to the Gallery application by the plugin I have implemented. The source code is available at Gitorious and is licensed under the LGPLv2. A binary package can be downloaded here. The MeeGo 2.1 Harmattan SDK, installed and working. A peek at the API documentation of libquillimagefilter, GalleryEditPlugin and GalleryEditUiProvider. As an additional improvement, it would have been nice to provide internationalization support, and return a string translated to the language configured by the user in the system settings. I had no time to figure out how to provide translations for a plugin yet, so the simple approach will do for now. Now maybe you are wondering where pixel data of the image is being manipulated... that's actually a good question! It turns out that Gallery uses the Quill library to do image handling, so it off-loads the actual implementation of image filters to it. The snippet above just calls the runEditFilter() method of GalleryEditUiProvider, which takes an identifier of a Quill filter plus a set of options, and runs it over the image. It would be tempting to just implement our pixel mangling here, but nor the GalleryEditPlugin, nor the GalleryEditUiProvider will give us access to the image data! Reading through the Quill documentation I noticed that it supports infinite undo and redo... same as the edit mode of the Gallery application! It makes sense that the Gallery API forces the developer to use a Quill filter to ensure that image edit history is seamlessly supported. If Gallery allowed to directly manipulate data, a plugin could go against the user experience presented by the application allowing to destructively edit images. The good thing about having to implement a Quill plugin is the fact that any application using libquillimagefilter will be able of using it. Also, when also using libquill, support for infinite undo and redo is provided. For free, no strings attached. Plugins are loaded from /usr/lib/qt4/plugins/quillimagefilters. Quill filter plugins are a bit different from the Gallery edit tool plugins. A subclass of QuillImageFilterInterface will act as a factory class that the library uses for creating getting information about the filters implemented by a plugin, and for instantiating the filters themselves. This means one plugin can define more than one filter, which is useful for implementing filters that have common parts in their implementation, or that are logically related. On the other side, each filter is a subclass of QuillImageFilterImplementation, and will do the actual pixel mangling. For each pixel in the image, the alpha value is kept (to leave the transparency untouched, in formats that support it like PNG), and an average of the red, green and blue components is done to get the intensity of grey for each pixel. This algorithm, even when being completely unoptimized and naïve (there are for sure algorithms that render better quality), works “well enough” and is “fast enough” even for huge images. A filter implementation (subclass of QuillImageFilterImplementation) does the pixel data manipulation. To make Quill use the filter, a plug-in implementing QuillImageFilterInterface should declare it as supported, and it must be able to instantiate it. Gallery plug-ins forward the actual work to Quill filters. This ensures that undo/redo is not broken. Gallery plug-ins are merely an stub which informs the application about how to display a tool. It may also implement the user interface for filters needing it. There are a number of topics that are not covered in this how to, like how to add an user interface to a Gallery tool plugin, or how to package the plugins to make them user-installable. Also, some details were left off to avoid unnecessary noise, so I would encourage readers to take a look at the source code for the plugin presented here. 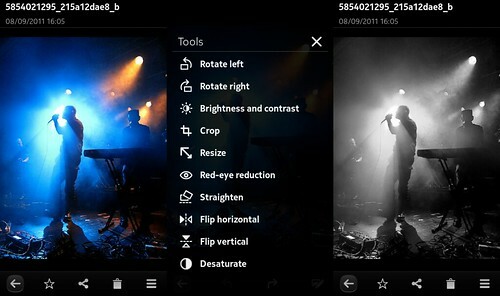 Side note: As a bonus, plugins made this way will also work from the post-capture view of the Camera application of the N9/N950.